Cooking a baked potato is among the simplest recipes. The way you decide how to cook a baked potato will depend on the time you have. Potatoes can quickly be baked in the microwave in a matter of a few minutes. However for this recipe we will be using an oven. Start by heating your oven to 350 degrees. While the oven is heating wash the potato. Scrub it lightly while washing. With a fork, poke about 8-10 holes in the potato. Coat the potato with the canola oil and then sprinkle with the kosher salt. Pace potato in middle of the oven rack and cook for 1 hour. After the potato is done add your favorite toppings for an extra boost of taste. Steak is the meat of choice when serving baked potatoes. If you prefer, you can also add chili, sour cream, cheese, bacon bits, and a plethora of other delicious toppings to your baked potato and eat it as a whole meal by itself. For a refreshing side add in a crisp green salad. White wine goes perfectly with baked potatoes. Baked potatoes are great for your health. 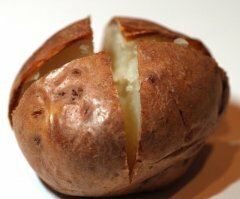 Baked potatoes aid in digestion and are one of the quickest foods to digest. Do not be afraid to eat the skin of a baked potato. The skin is packed full of minerals like magnesium and potassium.